One of the overarching aims of my blog is to engage critically and academically with new, different and alternative approaches to writing and communicating ‘development’. I believe that how we read, discuss and engage with diverse sources shapes our understanding of the ‘aid industry’ and the actors within. As a teacher of communication for development I also believe that we need to expand our media repertoire and that theoretical frameworks and empirical research need to be complemented with contemporary forms of how development is (re)presented in writing, for example in novels, blog posts, long-form journalism or aid worker memoirs. 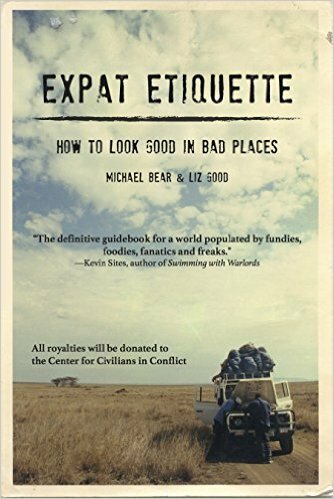 Michael Bear and Liz Good’s Expat Etiquette-How to look Good in Bad places is a very good example of a very contemporary approach to writing about aid and humanitarian work in the ‘field’ of ‘bad places’. The book combines insights from many years of working on development’s ‘frontlines’ with sometimes snarky and ironic self-reflections wrapped nicely around the theme of self-help and advice books on how to enter and survive said field. Or in the word of the authors: ‘we offer this sometimes-silly, sometimes-serious, sometimes-tongue-in-cheek handbook on expat etiquette’ (p.9 in the pdf version). ‘If you don’t like that wrinkly linen shirt in Oslo, chances are you still won’t like it when you get to South Sudan’ (p.13). The book is divided into two larger sections, the first section comprising three chapters and a second one comprising four more. Getting There and Away and Back Again – Traveling to Parts Less-Known, How to Stay Semi-Healthy and Food and Drink offer hand-on advice for new expats and those who upgraded from occasional traveler or short-term researcher to full-on ‘outside the capital city’ expats. Those chapters really help to demystify longer-term development engagements and at the end of day no fancy camping website or participatory mapping toolkit can help you when you realize that ‘farts don’t run down your legs’ (p.27) and it is time for immediate action to change your outfit. The key to martyrdom is to do just enough to convince everyone that you’re on death’s door, but to never utter a word of complaint. Needless to say, this is much easier to achieve when faking an illness than suffering from one (p.36). The second section focuses more on expat bubble reflections, including Learning to Love the Expat Bubble – Fashion, Friends, and F&%king, Learning the Expat Lingo – How to Talk the Talk, Escaping the Expat Bubble and Dealing with Wars, Rebellions and Other Exciting Events. Alternatively, you can embrace the expat bubble. Like any social situation in which a group of random people is confined to a relatively small space – say high school, or prison – the expat bubble promises immediate (albeit transitory) friendship, never-ending drama, and the wonderful opportunity to scorn the newly-arrived (p.42). I like Bear and Good’s realism. As much we (researchers?) like to indulge in ethnographic observations, analyze power structures of guesthouse get-togethers and long for a romantic notion of ‘the field’ outside mundane offices expat aid bubbles are here to stay. At its best, it’s like the cantina scene in Star Wars. At its worse, it makes you embarrassed and ashamed to be an expat. Of course, the two are often the same (p.48). But as I am writing this review from a position of some higher educational pedagogical responsibility I like the way in which the authors manage to include serious issues and at least point in the right direction when something goes more wrong than just bumping into at an ex-one-night-stand at a party. Let someone know the way they’re acting makes you feel uncomfortable. Pull the “culture clash” card if you need to, and chalk it up to your prude Western upbringing. But if that doesn’t work, and if you really feel uncomfortable, it’s best to consult a real advice book, or, better yet, your happy (or, as is more often the case, your “not-so-happy”) Human Resource person (p.52-53). Like with any workplace, organization and professional group, there can be encounters that cannot and should not be laughed off. Memorize the date of one significant or semi-significant event in the country's history. Tie all current political and / or military developments back to that date: "You make an interesting point about Congolese politics, but it's all really just an outgrowth of what happened in 1965" (p.56). When people you work or drink with begin pulling you aside and mentioning that they’re worried or concerned, or when you overhear someone mentioning that you don’t look quite right anymore. 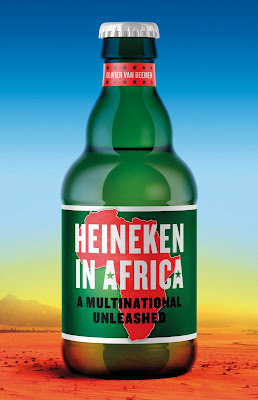 Especially when the people doing the worrying are barely functional alcoholics themselves (p.77). I also see Bear and Good’s co-written book as an encouragement for other ‘seasoned veterans’ of our industry to use writing as a coping strategy. Your insights will help us teachers and our students to get a more balanced idea of what this aid industry is all about. Bear, Michael and Good, Liz: Expat Etiquette-How to look Good in Bad places. ISBN 978-1-940-50310-3, 129 pages, 12.99 USD, Nortia Press, Orange County, CA, 2016. Full disclosure: I received a free electronic review copy in early 2015.